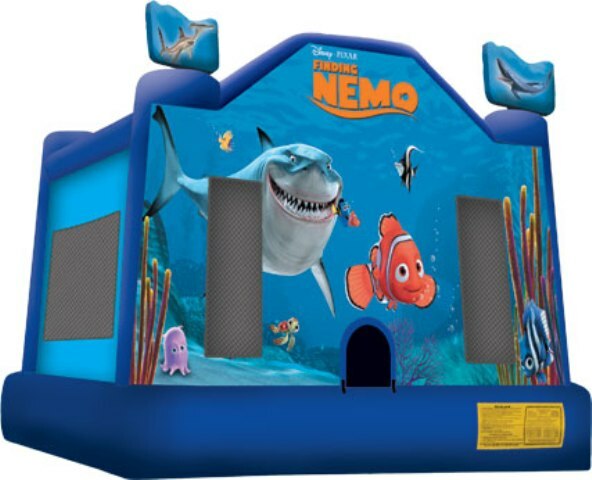 This licensed Finding Nemo large jumper takes kids to the drop off point with Nemo and friends for hours of bouncing activity. Participants can imagine swimming alongside Nemo and his fish tank pals Gil, Deb and Bubbles, or touring through the ocean with Dory and Marlin, or paling around with little Squirt, the sea turtle. The trio of sharks in recovery, Bruce, Chum and Anchor, round out the cast in this delightful artwork, sure to keep all Finding Nemo fans happy.